Selekt DSM is a dedicated streaming source for improved sound from any separates system, also available in 3 other configurations with integrated amp, Katalyst or both. Earn 4000 loyalty points when you order this item. 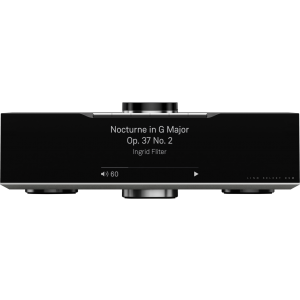 Linn Selekt DSM network music player will revolutionise your interaction with digital music. It’s a tactile and beautiful musical experience, better in every sense. It will make your system sound better and it will help you fall in love with your music all over again. As stunning to look at as it is to listen to, every element is precision engineered for the most authentic musical performance possible. Selekt DSM’s jewel-like dial and smart buttons are ready to be personalised just for you, giving you immediate access to the music you want to hear, no matter the source. Selekt DSM is designed to fit with your system and make it sound better, whatever your setup. Adding Selekt DSM to your system will make it sound better. And with Space Optimisation technology you get the best possible sound from your entire system configured just for you, no matter what speakers you have or where they’re placed. Selekt DSM includes a built-in pre-amplifier, enabling you to connect all your sources, including your turntable, to get better sound from them instantly. Customisable smart buttons provide immediate access, directly from the product, to anything you want to hear - no matter the source. Streaming services, internet radio, podcasts, your turntable... the choice is yours. With its modular, upgradeable design, your Selekt DSM can be adapted in the future as your needs change, either by increasing the performance by adding Katalyst or simplifying your system by adding integrated amps... Just add speakers.